Human CD48, Mouse IgG2a Fc Tag, low endotoxin (BC1-H5258) is expressed from human 293 cells (HEK293). It contains AA Gln 27 - Ser 220 (Accession # P09326-1). The protein has a calculated MW of 49.2 kDa. 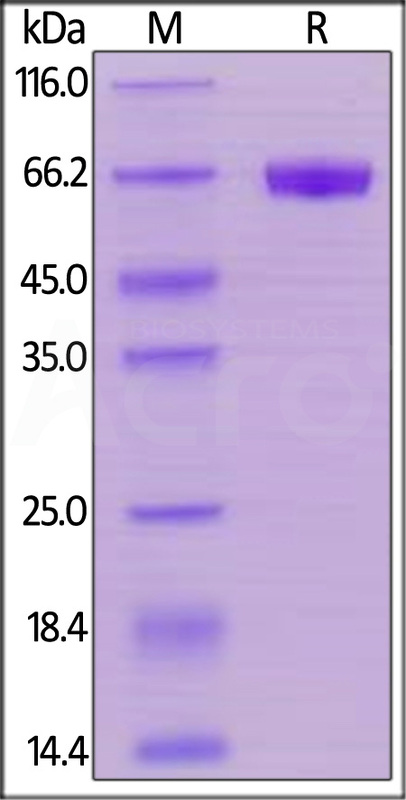 The protein migrates as 64-70 KDa under reducing (R) condition (SDS-PAGE) due to glycosylation. Human CD48, Mouse IgG2a Fc Tag, low endotoxin on SDS-PAGE under reducing (R) condition. The gel was stained overnight with Coomassie Blue. The purity of the protein is greater than 95%. Immobilized Human 2B4, Fc Tag (Cat. No. 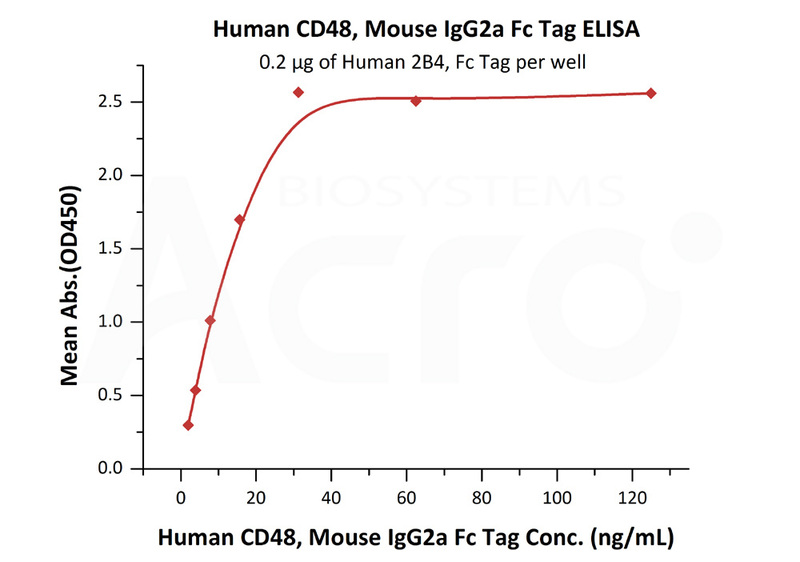 2B4-H5255) at 2 μg/mL (100 μL/well) can bind Human CD48, Mouse IgG2a Fc Tag, low endotoxin (Cat. No. BC1-H5258) with a linear range of 2-31 ng/mL (QC tested). CD48 antigen is also known as Signaling lymphocytic activation molecule 2, SLAM family member 2 (SLAMF2), Leukocyte antigen MEM-102, BCM1 surface antigen, B-lymphocyte activation marker BLAST-1. CD48 is a 65 kDa GPI-linked protein which belongs to the CD2 subfamily of immunoglobulin superfamily molecules. CD48 antigen contains two Ig-like C2-type (immunoglobulin-like) domains and two Ig-like V-type (immunoglobulin-like) domain. CD48 interacts with CD244 in an heterophilic manner. CD48 is ligand for CD2. CD48 might facilitate interaction between activated lymphocytes. CD48 is probably involved in regulating T-cell activation. (1) Korinek V., et al., 1991, Immunogenetics 33:108-112. (2) Wollscheid B., et al., 2009, Nat. Biotechnol. 27:378-386.